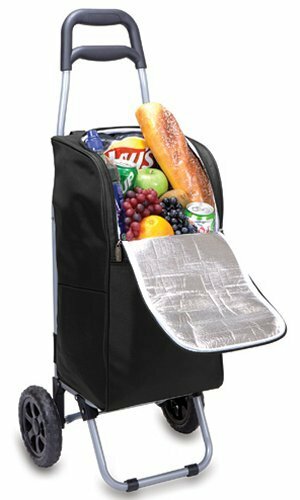 The Cart Cooler is the perfect all-around insulated cooler tote on wheels. The tote is fully removable from the trolley and has two large storage pockets on each side and a large zippered opening for easy accessibility. Lined with an insulated foil interior, it also has a removable heat-sealed, water-resistant PVC liner that holds up to 15 quarts or 37 12-oz. canned beverages. It sits on a sturdy, lightweight folding trolley complete with large, extra wide wheels and a stability bar to keep the tote upright when not rolling. Made of polyester micro-fiber, the Cart Cooler provides you with a convenient, almost effortless way to trek your goodies around in style. The Cart Cooler insulated cooler is perfect for picnics, trips to the beach, park or a stroll at the farmers market. Enjoy the versatility of the Cart Cooler on your next trip! Tote: Two flat side pockets, Large zippered opening, Removable heat-sealed water-resistant interior liner; Trolley: Large, extra-wide wheels with stability bar that holds up to 77 lbs. ; A split-level comfort-grip handle provides two handle heights for added ease.